I have struggled for many years to even accept that I had an inner child. I struggled with the thought that the little girl I was still remains struck inside of me – wanting to be healed, loved and connected to. I feared that if I accepted that part of me, that it would mean I was mentally ill, or I would be more damaged than I thought I would. I was afraid that I would be looked at weird by even mentioning “my inner child”. It was a while back ago in therapy that my therapist shared with me that even he has an inner child – we all have an inner child. For some people their inner child is stuck in place – wounded – scared – filled with old messages that never allows the adult to grow in certain ways. I have accepted and come to really embrace the inner child within – to learn and understand the difference between the old messages of the past vs. the truth of today. The past couple of weeks, I have gently moved the child within forward with me – letting myself lead her to a new path of healing and understanding. Allowing her voice to be heard – but at the same time trusting my own self, my own voice, and my own wisdom – – showing her there is a trust and connection we can learn to accept without being hurt. I have accepted to help bring forward and heal the younger me, not just accept that there is a younger me, but to help heal those wounds she holds and trust the process of letting myself lead, while understanding the hurts and fears that the younger child holds. My therapist has really helped me to bring her forward so that I can help her – help me. Not pushing away her fears and feelings, but allowing them to be here. Allowing the hurts to tell a story and to heal from her voice. I really came to understand something this past week (a week that was filled with a lot of hard things), that a part of taking steps out of this isolating place I have been in, is truly about allowing the inner young child to be here, let her be, let her voice be heard, let her fears be known, and allow myself to feel that. It has changed me – allowing the young part to be present. It has changed me in a way that I am seeing things differently, and I am able to work through the fears I go through around many things – including taking steps when steps are needed. 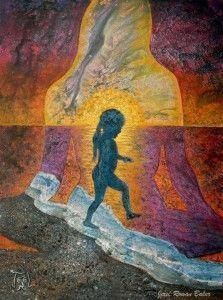 I never realized just how much the inner child holds – the moment I accepted her, I could hear things a lot louder and clearer and understand why I am the way I am, because of her. . . . which helps me to understand what part of her needs healing. No one can heal the inner child but me, I can have support through it, and I can have help to love her, but only I can truly heal her wounds by loving her to healing and accepting who she is within. Beautiful, Karen! Thank you for sharing your inner soul…your inner child! She is YOU and only you can release her to BE…Let her be You! Hugs and love to you as you move forward with her…with your inner child! This is wonderful, Karen, thank you for your vulnerability and hard-won wisdom!